So I do enjoy holiday fiction. I love reading it and I might, just MIGHT have a soft spot for Christmas chick lit and romances (Shut up. It’s December stress). I also love writing holiday fiction. Now, some of this can get…fascinating, especially the pieces that are in Lost in the Shadows. Candles is a story about a makeshift family surviving the zombie apocalypse and trying to stay sane while keeping Christmas Eve traditions alive. There’s also a story about reincarnation and astral travel that may involve the little drummer boy. Compared to those, Holly and Ivy is pretty tame and normal. I actually got the idea from a writing prompt exercise in like August, though it’s also based on one of my favorite holiday songs and probably owes a little to Hans Christian Andersen in a really backwards way. The story took hold and wouldn’t let me go, though, and soon I had something unique (for me) and special. Not only does it incorporate the holiday feel I love to read about, but it also doesn’t shy away from the fact that sometimes unfortunate things happen during the holiday season. Some people are cynical or burnt out or whatever. Sometimes you need a little kick in the pants, a little magic to help you out. Sometimes you need a friend who’s a dryad. When Holly’s life falls apart, she moves back with her parents and has to fight through fear and lack of motivation. When she takes a walk out to the Christmas tree farm her family owns, she’s suddenly shoved face to face with the imaginary friend that isn’t so imaginary – the dryad Ivy. While Holly’s grown up and been burned by life, Ivy remains innocent and eager to cast humans in the role of ignorant murderers. Even she is concerned about her human friend, though, and offers Holly a trinket that could change everything for the thirty-something…but it will change the dryad’s own future, as well. “What do I do with it?” I asked. I told myself I was just playing along, suspending reality to make Ivy feel better. Although if that was the case then perhaps I should have really examined the fact that Ivy was real and not me suspending reality to make myself feel better. “You hold it now until it gets to know you. You keep it safe in your possession and it shall bring you ease and grace,” the tree sprite giggled. “And that really works?” No matter how I tried I couldn’t hide my skepticism. The next smile didn’t hurt quite as much as I traced the delicate edge of the tiny plant with the pad of a finger. The petaled head shivered and softly brushed against my calluses. “I thought everyone was going to have a heart attack when you burst out of the thing and started singing to everyone! Mrs. Robinson finally played it off as the whole class playing a trick on her. We had to go without milk time for a week.” I’d gotten in so much trouble with my parents for lying in school and saying that I had a magic plant. Given that I was adamant that I’d been telling the truth, it was a hell of an ordeal for a six-year-old. “’Twas so much fun!” Ivy paused mid-pirouette. It was downright disgusting that she could hold the arabesque for so long and not even wobble or suffer a leg cramp. “Though I would not want to live in such cold halls all the time.” She paused and took a long breath, much longer than I or any other human could possibly inhale. Before my eyes her skin became greener, infused by the crisp clean air. “You need to be in the trees, Holly. Mortals refuse to understand that they must live where things grow. Now that you’re home, let’s play!” She leapt over my head and landed effortlessly beside her home tree, staring at me expectantly. Maybe it was being back home or maybe it was just being back in the good fresh air, but her suggestion made me giddy. It suddenly sounded like the exact prescription I needed, the one thing I’d been missing through all those frustrating years. My fragile mind and heart demanded an escape. They couldn’t take any more disappointment, any more expectations or responsibility, and they especially couldn’t take any more reality. I nodded and tucked the strange clover deep in my pocket. The breeze had dried my tears and the heavenly scent of grass and pine put the sudden urge to run in my feet. Suddenly the heavy air and the blazing sun didn’t matter so much and my anxieties were willing to take a momentary backseat to the chance to goof off for an afternoon. “Are you sure you’ll be okay?” I hesitated, hand still at my pocket. After losing her job and her boyfriend, Holly returns to her parents’ farm. Embarrassed and hopeless, she doesn’t expect to bump into a forgotten childhood friend that wasn’t supposed to exist. Ivy is not only a dryad, but she lives in the pine trees Holly’s family grows to sell at Christmas. 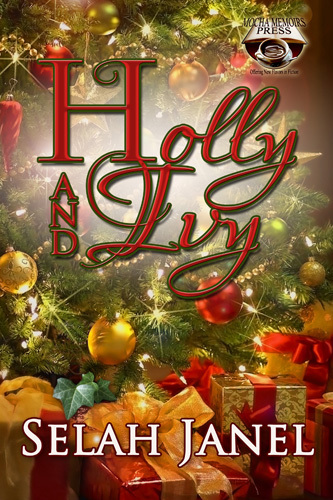 As the old friends reconnect, Ivy not only shares her strong oninions, but gives Holly a charm that will change both their lives. As days melt into weeks and the seasons change, Holly’s life magically turns around. Christmas not only brings surprises, but a choice for the human woman. What’s more important: stability, success, and love, or keepinga promise to an old friend?